The September edition of the newsletter of the Lytle Creek League League of Conservators is available, now for the first time from this website. The lead story of this edition is our preparations for the annual Lytle Creek Day. The schedule appears also on this page. See the newsletter for a cordial welcome from Roy Joe Stuckey, president and founder of the League. A blind for the Prairie? It will soon be Lytle Creek Day, number two! Mark your calendar for October 3, 2009, for this special day, officially proclaimed, in 2008, by the Wilmington City Council and Mayor David Raizk as the first Saturday in October, each year thenceforth. Actually, the upcoming luncheon event will be the fourth annual celebration of the creek in Wilmington’s backyard. The first such was in 2006 with the dedication of the Lytle Creek Trailhead Pavilion. This year, as in the past, each of the local environmental organizations will again be assisting the Lytle Creek League of Conservators to stage the observance. The League expects to engage several interested stakeholders in initiating long range planning for the Greenway. It applauds similar efforts announced recently by our neighboring community of Lynchburg, Ohio. In difficult economic times, nearby natural resources of soul soothing beauty become priceless. The community creek in our backyard and its riparian corridor is, throughout its length, owned by City, College, County, corporate and private owners, each as cooperating entities. Thus, our community can be grateful that its Lytle Creek Greenway is now mostly open to public access at no charge for all to enjoy. "To help our community to identify, improve, extend, preserve, appreciate, use, learn from, and to enjoy the natural areas designated as the Lytle Creek Greenway." In pursuit of this mission, the League supports Clinton County Open Lands Inc. as it facilitates conservation easements; Clinton County StreamKeepers as it tests the creek for signs of recovering life; the Clinton County Coalition of Trails as it seeks additional access for hiking; the Clinton County Park Board as it manages its new prairie, forest and other parks downstream; Wilmington College as it fences out its livestock, manages and expands its arboretum, and supports its nature trails; the Wilmington Park Board as it connects its parks, nature reserve and bike trails; corporations which supply money, services, and encouragement; land owners who may be considering conservation easements for additional public access; and most important of all, the many volunteers of all ages and levels of knowledge who work tirelessly to further the vision of a great legacy for oncoming generations who will live in this beautiful place. All of these elements, I hope will, in some way, be recognized in several three to five minute presentations by appropriate speakers contributing to the carefully orchestrated program starting at 11:00AM, Oct 3, Lytle Creek Day, number two. A great environmentalist will be honored; and a good lunch will be served. You are warmly invited to please reserve at 937 728 9886 and then, to come, to enjoy yourself, and to learn how you may be able to make your life richer for the experience.--- rjs Sept 18, 2009. Imagine eating crickets, grasshoppers, and flies and not just hopping into your bed each night, but having to build it new every day. That’s what happens in the world of arachnids. Make plans now to attend the No Child Left Indoors Spider Hunt at the Lytle Creek Prairie from 10:30 a.m. to noon on Sept. 26. Learn about what and how spiders eat and all about the webs they weave. Adult leaders will assist children as they look for and observe orb weavers, funnel weavers, jumping spiders, wolf spiders and more along the trails. The educational program will include information on spider habitats and activity. We will be observing spiders and identifying them in their natural habitat. Children should wear long pants and sturdy shoes. Spider program leader Harriett Clark shared, "We plan to observe spiders in their natural habitats without disturbing them since it is a tremendous expenditure of energy for a spider to spin a web, which it does every night. We may even get to see them eat a cricket or two." The program is free, but pre-registration is required. We will be able to accommodate up to 20 elementary age children (and their adult escorts, who must stay for the program). The Lytle Creek Prairie is along the 4-C Bicentennial Trail. Parking is available at the David Williams Park on Fife Avenue and the Southeast Neighborhood Park near Paris Avenue. Participants are encouraged to bike or walk from the trailheads and enjoy the trail as part of this program. From either trailhead it is approximately a 15 minute walk. Both trailheads are excellent locations for picnicking after the event. To pre-register or for questions, call Lori Williams at 382-3682. No Child Left Indoors is a local group of volunteers committed to the belief that children need nature and nature needs caring humans. Toads and Frogs Spring Fling - Details to be announced. Expansion. We need to work with other local organizations in expanding protections and access along the Greenway. The principal vehicle for this will probably be securing easements on adjacent properties, although we should also be alert for opportunities to acquire land outright. Roy Joe volunteered to take the lead in this area. Conservation, Preservation, and Restoration. We need a concerted program of stewardship for the areas we presently have access to. 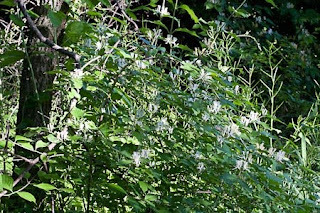 Since the beginning of the League, we have recognized the problem of invasive species along the Greenway, particularly the problem of bush honeysuckle, arguably the most abundant plant on the Greenway down to the bike path. 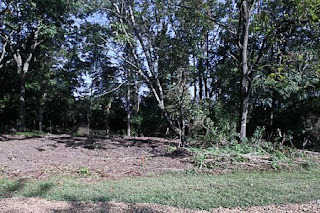 We have had several work days devoted to clearing bush honeysuckle in the past. These have paid off, particularly in the area around the beech tree, which has freed up an area that, judging from the carvings on the tree, has been a gathering place for Wilmingtonians for more than fifty years. 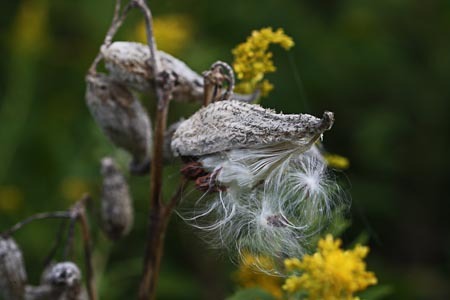 We wish to extend this effort and complement it with a program of restoration, bringing back native wildflowers that have been shaded out by the invasives. Lori Williams will take on this formidable task. Education, entertainment, and enjoyment. Our most public successes have been in the area of educating the public about the natural world, thereby generating an increased capacity for the general enjoyment of our natural heritage. There is no better example of this than the success of our No Child Left Indoors program. This program has benefited from capable and energetic leadership, a dedicated core of knowledgeable volunteers, and ample funding through a generous donation from an anonymous friend. We need to expand our educational activities as there is clearly a great demand for this type of activity. At present we have only a minimum of interpretative materials available to users of the trail; specifically, the tree identification signs the Jim Ramsey helped with. We envision incrementally building 3-5 wildlife viewing blinds along the trail with interpretative materials inside the blinds. Eventually, we would like to see one of those blinds expanded in stages to house a nature center. When fully developed, we anticipate that the center would have space for three kinds of activities: wildlife observation, classroom-type space for events such as NCLI, and a laboratory for citizen science programs. The latter might comprise bird banding activities, wildlife population studies, stream quality surveys, etc. Bob Powell has consented to look further into this area. One of the leading causes of declines in native species is the introduction of foreign species that become invasive. Most introduced species will die out, but some are fantastically successful. Transplanted to an area that lacks its customary competitors, diseases, etc, the species takes off, elbowing aside native species. Examples abound: House Sparrows and European Starlings have done a number on native hole-nesting species such as Eastern Bluebirds. Zebra mussels are spreading throughout inland waters, ;hitching rides on pleasure boats and outboard motors. Numbers on the Great Lakes are now so great that some municipal water intakes are becoming clogged. We have them here in Caesar Creek Lake. The custom of importing plants is as old as the nation: early colonists routinely brought their favorite plants with them and these are now widespread and uniformly regarded as "our" wildflowers. In fact, until recently there was a Section of Foreign Seed and Plant Introduction in the US Department of Agriculture. Asian bush honeysuckle (also known as Amur honeysuckle, shown in flower above) was first imported into the US in the 1890's and was being promoted as late as the 1970s by the US Soil Conservation Service for erosion control and wildlife food and cover. Unfortunately, once they got loose, they found eastern deciduous woodlands so conducive to their survival that they quickly took over the middle story of many forests. 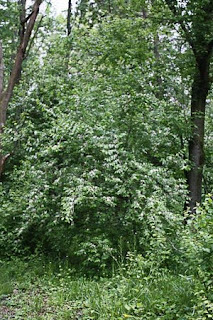 With their dense structure, as seen above, bush honeysuckles quickly eradicate the herbaceous understory by shading out the native plants. Serious infestations can inhibit tree regeneration, effectively stopping forest succession. If you want to see bush honeysuckle, look no further than the area around the Trailhead Pavilion. 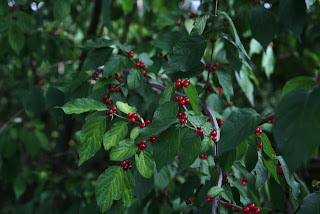 At this time of year, it is best found by looking for the bright red berries, as shown in the photo at left above. Otherwise, it is a biggish (6-15 feet) bush (unlike the native honeysuckles, which are mainly vines) with paired (opposite) leaves as in the photo at left. In the spring, it is covered white honeysuckle-like flowers which are not as fragrant as the native honeysuckles. From the pavilion, it is hard to throw a rock without hitting a bush honeysuckle. Lori Williams wants to change that. She and volunteers from VISTA and the college have begun to aggressively clear bush honeysuckle from around the pavilion, where the infestation is densest. They clear down to he bare soil and paint the stumps with straight roundup. Results in other honeysuckle control programs indicate that this treatment is successful in killing the plant and the rootstock. Killing the rootstock is important, or the plant will quickly return. As shown in the picture below, Lori and friends have made a substantial start on eradicating this nuisance. The next step is to seed the cleared area with native wildflower seeds in time for them to germinate in the spring. Then the clearing crew will move on to the next area. It is estimated that it will require several years of effort to complete the program. As usual, we are dependent on volunteer contributions of labor and funds. If you would like to get involved, call Lori at 382-3682. Out of this initial thinking, a strange kind of convergence has arisen. Bob Thobaben and Lori Williams talked it over and Bob told her he had been thinking about the possibility of a blind at the southwest corner of the County Prairie. Bob Powell googled wildlife viewing blinds and found a wonderful document surveying about 100 candidates (Click here for the pdf. This is a large file, probably not suitable for those on a dial-up connection). Among them is a blind made out of a converted grain bin. 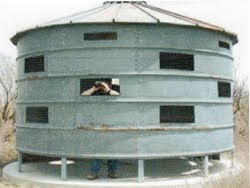 A grain bin blind situated at the southwest corner of the County Prairie fulfills most, if not all, of our criteria. Once in place, it will be almost indestructible and nearly maintenance free. It will accommodate an entire third grade class and give views in all directions. 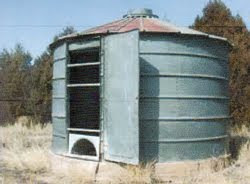 We have more than one lead on the possibility of a donated grain bin and in a meeting of the County Park Board on Monday, 14 Sep 09, a resolution was passed unanimously granting permission for such a structure to be established at the County Prairie. The Trailhead Pavilion is, just as we hoped, becoming a popular venue in the community. It is frequently used at lunchtime as a refuge from the office, though sadly not to the extent that it was when the Airpark was really humming. Other groups in town are holding meetings, picnics, potlucks, etc and of course the pavilion is expressly designed for those sorts of gatherings and we welcome them all. Perhaps the most unusual use of the Pavilion so far is as a venue for bagpipe practice. A couple of afternoons a week, Dave Chesney can be found huffing and puffing into his instrument. Dave is a retired Navy chief petty officer who has served tours in Iraq and Afghanistan. Dave now works at New Sabina Industries. Apparently, his piping is not very popular at home, so Dave drops in at the Pavilion where he bothers no one. Dave plays with a bagpipe group in Dayton and does a creditable job on old bagpipe favorites like "Scotland the Brave" and, of course, the inevitable "Amazing Grace." Dave also refills the birdfeeders when he sees them getting low, which makes him doubly welcome. What uses have you made of the Pavilion? Let us know. Even better, send us a picture. We have installed a bird feeding station just behind the Pavilion. 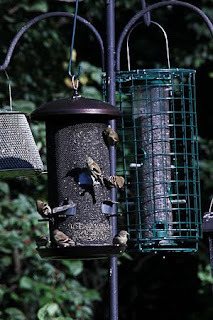 The feeders, shown at left, consist of a suet feeder, a thistle seed feeder, and two kinds of sunflower seed feeders. The suet feeder (lower right) draws insectivorous birds. This summer it was hammered by Common Grackles. The thistle seed feeder (left front) holds a very large supply of this favorite food of goldfinches, also called Niger or Nyger seed. The picture at bottom shows eleven goldfinches on the feeder at one time. Right now, you might be asking yourself why aren't these goldfinches gold? The answer is that goldfinches have one of the most complex molt strategies of any songbird. At this season, the adults are molting into their drab basic plumage for the winter. (The females are never very gold at any season.) The young that fledged about a month ago are also molting into a formative plumage that is at least as drab as the females. Some of the young males won't achieve their full glory until spring after next. The other two feeders dispense sunflower seed, the best all-around food for songbirds. The cage around the feeder at right rear screens out the big birds and insures that chickadees, titmice, house finches, and sparrows have a fighting chance at a good meal. The metal feeder at left rear is accessible to birds of all sizes, including cardinals. The metal cylinder seen at the bottom of the picture deters raccoons and squirrels. Both of those species are basically smarter than people and feeding birds is a constant battle of wits with them. For instance, our supply of seed for replenishing the feeders is kept in three small garbage cans at the foot of the bridge-like dais inside the pavilion. I purposely selected cans with very tight lids. I am a former high school lineman, and I have to struggle to get the lids off. The raccoon had no problem. I now have secured the lids with bungee cords and the raccoons have not so far figured them out. I am sure they have an R&D team working on it. In the meantime, if you refill the feeders, be sure the lids are on tight when you finish and that the bungee cords are in place. In a couple of months, when the winter finches and sparrows arrive, the population at the feeders will change dramatically. Be sure to stop in regularly to check them out. The feeders can be readily observed from the tables in the Pavilion. You can even observe the birds from in the open, as long as (a) you are not standing, and (b) you are not moving. The pictures above were taken from the setup shown at left in order to get a good angle on the action. The birds all scattered while I was setting up, but they all came back in about five minutes. As I write this, the bird population in Clinton County is about as high as it gets. The birds have all just brought off new clutches of young which have yet to face the decimating rigors of winter. We are at about the peak of the migration of birds that breed to the north of us, but many of our summer residents are still with us. Unfortunately, fall birds are sort of an acquired taste: most of them are silent so we don't have the raucous dawn choruses of the spring, most are molting or already in their basic plumages, and all of them skulk around trying not to be seen. I don't want to discourage you from birding in the fall, but you might want to spend some time looking at flowers. The late summer and the fall are the last hurrah of the wildflowers. Most of the flowers hardy enough to brave the chance of an early frost are the composites. The two that are the standard bearers of the season are asters and goldenrods. The latter are nuisances for hay fever sufferers, but a whole field full of them can be undeniably exciting. Here are some others that you might find interesting. Ragged robin appears in pastures in September and hangs on as long as it can. Old dude with a variety of sunflower appropriately called "Tall Sunflower."